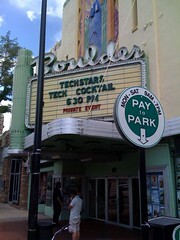 I was in Boulder Colorado yesterday for Techstars demo day. This is the second year that I have attended this event. Techstars started in Boulder three years ago and this year expanded to Boston. It's one of the many Y Combinator style startup programs and in my opinion, one of the best. They work very hard to connect their teams with mentors and the value of the mentoring shows in the quality of the projects and the presentations. I saw ten companies present yesterday morning and every single presentation was good. Like all early stage investments, not all of these teams will end up being successful, but I am sure that many of them will. My favorite projects were Next Big Sound, Everlater, Take Comics, and Vanilla. I almost hate to mention my favorites because all the projects were strong and the ones I like best reflect the areas I am most interested in as an investor. If you want to see a list of all the companies that presented, Don Dodge has a post up on Techcrunch with a description of all ten. Everlater actually used our recent trip to Stockholm and Slovenia as a demo for their service so I can't help but like what they are doing. As a family that does a lot of travel blogging, I can attest to the fact that there isn't anything that does a great job in this sector. I'm eager to use Everlater on our next trip this winter. Next Big Sound is "compete for musicians". They made the strongest presentation, the service shows very well, and they know exactly what they want to be and why. It is interesting that they were accepted into Techstars with a different plan and switched it during the program. There was no hint of that. Nicely done. Take Comics is "iTunes for comics". I confess that I am not a big comic fan and never have been. So this one is not in my sweet spot but I was very impressed by the product they have built. I think they will be successful. Vanilla is open source forums software for the web. The team has been working on this project for quite a while before joining Techstars. So the value they got out of Techstars was not a product. They got mentoring and motivation to build something bigger. And they announced a hosted version yesterday which is the beginning of a revenue model and a business. That's great to see. There are nine more Techstars companies in Boston and they have their demo day in early September. I'm not sure I'll be there someone from our firm will be there. Speaking of these programs more broadly, we are very big fans of them. We've been attending Y Combinator demo day since the early days and this year we will attend six different demo days and wish we could attend more. These "startup programs" are teaching hundreds of teams each year how to start and build businesses, they increase the pool of talented entrepreneurs, and they increase the number of quality opportunities we can invest in. That's great for everyone.